Are veneers permanent? Yes, Veneers are a permanent way of changing the appearance of your teeth in cosmetic dentistry. A dentist uses a thin, tooth-colored shell to cover the front of your natural tooth. If you have cracked, chipped, uneven or stained teeth, you might consider getting veneers. Another reason to get them would be to close a large gap between teeth. Although they look great when done correctly, deciding to get veneers should be carefully considered because it does permanently change your teeth. Two types of materials have been used in the manufacture of dental veneer, one in porcelain and the other in composite resin. There are many differences between these two materials that are used to make veneers. Composite veneers can be placed directly on a patient. Teeth without much preparation or they can be made at a laboratory. On the other hand, porcelain veneers can only be applied after they have been made in a laboratory. 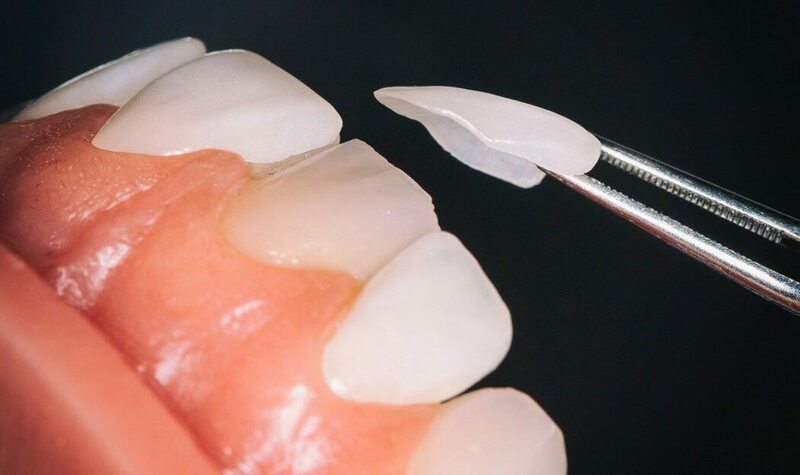 Another difference that can be observed between porcelain and composite materials is that facets made of composite materials are more accessible to repair because they do not tend to split, as opposed to porcelain. If a patient decides to use porcelain, many veneers are therefore applied at the same time. The invention of this restorative layer is not new; it has been around since the 1930s, when a dentist, Charles Pincus, invented her. The first versions were not very useful, because they appeared after a few days of application. Was mainly attributed to the suture material that was used to connect the tooth to a veneer. As time went by new materials started to be tested in order to improve the lifetime of these artificial implants, composite resins proved to be quite useful because they were strong enough to bond porcelain to a tooth almost permanently, while this substance can provide nearly permanent results the life of the veneers themselves is not that incredible, many of them will only last for about 10 to 15 years, after that he should be replaced once again with newer ones. It is fascinating to see how technology changes everything, using technologies such as CEREC patients are now able to get a digital scan of their oral cavity which will help dentists manufacture crowns and veneers which are perfect for the patient’s mouth, all this in record time. When going for affordable dental veneers, you get the best treatment at the hands of well-qualified doctors. Most of the dental clinics are equipped with state of the art equipment. Moreover, you get the best service; the staff is very cooperative. In the dental clinics, you can also get expert advice beforehand. Although a porcelain veneer is more likely to last longer and is more stain resistant, there are times when a resin veneer is more appropriate. Composite resin is preferred in some cases because it is possible to adjust and repair them if they don’t look quite right or become damaged. The dentist will take impressions of your teeth to use as a guide for designing your veneers. Before they can be attached to your teeth, the dentist will have to file away some of your natural enamel. This step is not reversible. Then they will cement the veneer to your natural tooth using a dental resin. Some patients have increased tooth sensitivity because of the removal of the natural enamel.